In September of 2009 Conewango Products Corp. moved into their new location at 1890 Lyndon Boulevard in Falconer, NY. Conewango Products Corporation was founded by dairyman Gunnar Anderson as a dairy supply wholesaler in 1931. By the late 1960’s, Conewango had formed a relationship with Empire Rubber Mills of Christchurch, New Zealand to manufacture milker inflations and other dairy rubberware under the Conewango label. After changes of ownership, the company transitioned from a full line dairy supplier to a distributor of milking machine rubberware exclusively in 1984. 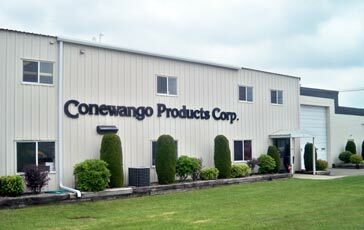 In 1993 Conewango Products became a subsidiary of Skellerup Holdings, a publicly traded company manufacturing reliable, quality products from industrial rubber products and dairy rubberware to waterproof footwear, mining products, vacuum pumps and construction products employing over 800 people around the globe. With a customer base of over 110,000 dairies and 200 dealers across North America, Conewango remains primarily a distributor of milker inflations and dairy rubberware but also a distributor of other agricultural rubber products manufactured within the Skellerup group. Conewango’ s distribution center was located in Randolph, NY until 2009 when it was moved to the new location at 1890 Lyndon Boulevard in Falconer NY. Throughout our history Conewango Products Corporation has been widely known as a provider of high quality products for the dairy operator and for excellence in customer service. At Conewango Products we truly value your business. Our policy is to ship all orders within 24 hours of receipt. All of our office personnel and our salesmen in the field stand ready to service all of your needs whenever called upon. If you have a comment, complaint, question or suggestion, please feel free to contact us in the manner that is most convenient for you. Service we take very personally. A helpful customer service representative is always just a call away at 800-828-9258. Our inspection process ensures only the best are delivered to our customers. best are delivered to our customers. Our high quality Conewango liners ensure that our customers are happy and it is proven by our long time relationships with our dairymen and dealers. Our quality is based on keeping the highest standards for raw materials, manufacturing process in our ISO 9002 accredited factory, and our high standard for inspectors that hand inspect each of our liners. We guarantee our quality with our unconditional money back guarantee for our liners as well as any of our other Conewango products.